Beautiful RARE low serial # 003 certificate from the Compañía Española de Neumáticos y Caucho Goodyear S.A. issued in 1926. This historic document has an ornate border around it with a vignette of the company logo and an underprint of an old automobile tire. This item has the signatures of the Company's President and Secretary and is over 81 years old. The certificate is mounted on four corners to a mat, which we have not tried to remove. It is in excellent condition. This item would look terrific framed. The certifiate has various stamps, including a very nice impressed Goodyear stamp with the wing-foot, and a stamp from the bank: "Bank of London and South America Limited". In the center is a recessed Goodyear tire with the old "Full Diadem" tread pattern. 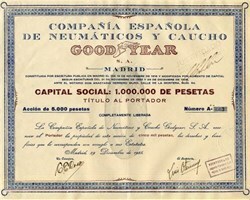 The company was established by Goodyear for the purpose of distributing its products in Spain. However the certificates were never circulated, because by the time they got around to it, the entire enterprise was interrupted by the SPANISH CIVIL WAR, which began in 1936. Goodyear did not return to the Spanish Market until a couple of years after Franco died in 1975. The company is called "Goodyear Dunlop Tires España", whereas the name used during that brief period prior to the Spanish Civil War was, "Compañía Española de Neumáticos y Caucho Goodyear". The company was established in 1921 with 100% U.S. Capital. It had 3 branches: Madrid (Calle Núñez de Balboa, 30); Barcelona (Paseo de Gracia, 93); and Seville (Calle Julio Cesar, 3 y 5). Because it left the market in haste at the outbreak of the Civil War, when Goodyear returned to the market with its own subsidiary in the late 80's, the older version had to be officially "liquidated", according to Spanish Law. Note that the Goodyear impressed stamp with the wing foot is on bottom right of the certificate.